A double "BS" granddaughter, "Kool Max" has type galore wrapped up in a beautiful silver coat! 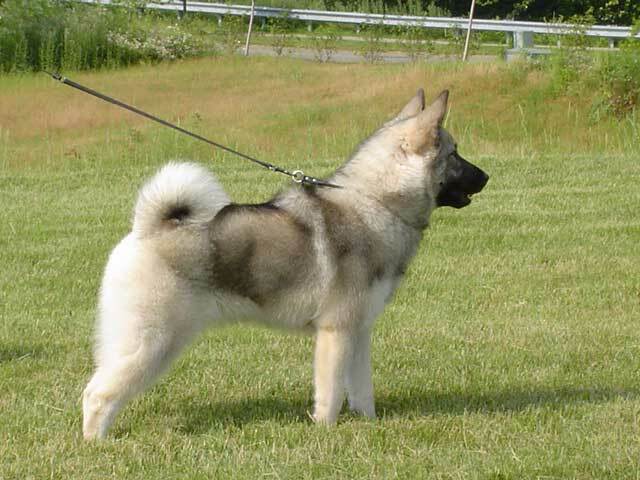 Her first venture into the ring as a Puppy saw her winning Best in Sweepstakes at the Northeastern Illinois Norwegian Elkhound Association Specialty Show under breeder Andrea Schokker ("Highland"). Her first major was from the Puppy class at the Norwegian Elkhound Association of Minnesota Specialty Show under master breeder Lana Hall ("Rikkana"), her second major came at the Garden State Norwegian Elkhound Club Specialty Show under breeder Rose Martino ("Fromar"), and her third major and title came from the Bred By Exhibitor class at the Suffolk County KC under Mrs. Lee Canalizo. Her two litters by the half-brothers SBIS American/Canadian Ch. Kamgaard Kover Your Tracks and SBIS American/Canadian/Bermudian Ch. Kamgaard Kommander In Chief produced some lovely Champions as well as top agility star Ch. MACH Kamgaard Kovered In Grey MXS MJS OF. Kool Max was a constant presence here and was our resident "flower child" -- loved everyone and never knew an enemy. Rest in Peace, Kool Max -- we are missing you.